Lid Sealsol LS-809 is PVC based heat curing gasket compound, used by metallic pails manufacturer sat the metallic top lids’ grooves to provide a soft seal/ gasket between both pail body and its lid, to prevent any possible leakage of the contents. The product is applied through pressure activated lining machine and cure din oven at around 180°C for about 10 minutes which on complete curing provides a soft rubberised flexible gasket ring. On perfect curing, LS-809 is Non-Toxic, Non-Corrosive & Non-Rusting to metal sheet, provided used as supplied.The product is safe in handling and contact. 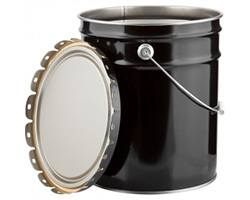 Suitable mostly for the small metallic drums and pails meant for packaging/ filling a very wide range of products e.g. special formulated products paints, varnishes, lacquers,lube oil, grease, pesticides/insecticides and such other corrosive products. Food Grade is also available on request.